The word “hope” is bandied around quite a bit in Star Wars Episode VIII: The Last Jedi. During a perilous moment, one character compares it to seeing the sun. Leia, who uttered it at the very end of last year’s Rogue One, says with a glint in her eye. For fans of the storied saga, the word is more of a rallying cry. We hope The Last Jedi will live up to the hype. We hope it will be a worthy final project for the late, great Carrie Fisher. We hope Mark Hamill’s Luke Skywalker will be Luke Skywalker. Here’s the reality: The Last Jedi is . . . an ultra-rousing and satisfying success. It’s a Star Wars movie that appeals to the action-oriented, easily awed child as well as the child within that still roots for good to triumph over the dark side. No spoiler to reveal that kindhearted characters do the right thing. Sinister characters do the wrong thing. But Episode VIII stands out as a fascinating entry because it explores what happens when a person falls somewhere in the middle. (There’s a reason why lightsabers don’t come in shades of grey). Even as a positive energy source, the Force still has its limits. Or does it? Luke Skywalker knows the answer. And if nothing else, rejoice because we’re still witnessing Luke’s journey. 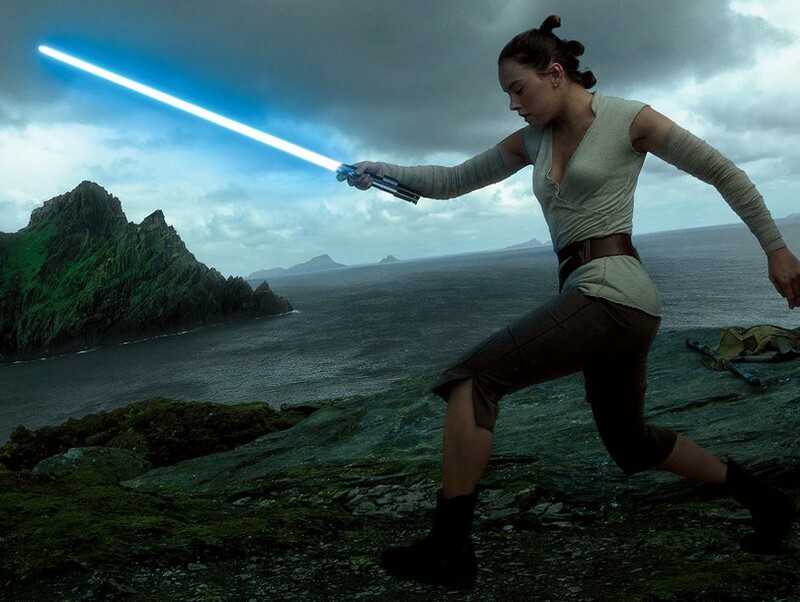 While Episode VII: The Force Awakens checked all the boxes, it felt like a cheap mind trick that the self-exiled former Jedi master did not speak a single line of dialogue — he only looked warily as Rey (Daisy Ridley) handed over his light saber in an almost literal cliffhanger. Here, he not only talks, he has plenty to say. This is a heavy, beaten-down Skywalker, a man still reeling because his own nephew, Ben Solo, turned on him and morphed into powerful Kylo Ren (Adam Driver). Despite Rey’s pleading, he has zero interest in schooling her and helping the Resistance. If you squint hard enough, though, you can still see remnants of the noble warrior. And he sees something special in this mysterious, driven onetime junkyard scavenger in search of her parents. Willing to take a chance on her is he. That is Side A. In Side B — side BB-8? — Leia’s Resistance troops battle General Snoke (Andy Serkis), Kylo Ren, General Hux (Domhnall Gleeson) and the rest of the First Order. And things aren’t going well. In an attempt to thwart the next attack, former Stormtrooper (John Boyega) teams up with a mechanic (plucky newcomer Kelly Marie Tran) to travel to a new planet and track down a shifty tech whiz (Benicio De Toro, who gets “and” billing in the closing credits). Their destination is an intergalactic version of Monte Carlo. 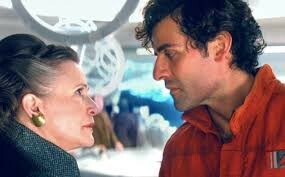 Back on the starship, newly demoted fighter pilot Po (Oscar Isaac) tries to win over Leia and her second in command (Laura Dern). Writer-director Rian Johnson (Looper, the famous “Fly” episode of Breaking Bad) at times overreaches trying to balance these separate storylines and myriad of characters into one cohesive unit. Lupita Nyong’o has nothing to do in her glorified cameo appearance, while the middling Del Toro section fails to reach its potential. The result is a bloated running time of about 2 ½ hours — that includes about seven different points in which I was sure the movie was going to end only to see it continue to plow ahead. You always want your Star Wars films to move at light speed, not drag in the middle. When the two plots do intersect, it’s flat-out electric. Anyone well-versed in creator George Lucas’ original 1977–83 trilogy know that the sandwiched installment, The Empire Strikes Back, is the meanest of the trilogy. (Three words: Frozen Han Solo.) Whereas The Force Awakens mirrored the original Star Wars in the nuts and bolts of the story, perhaps that it’s only fitting that The Last Jedi deep dives into unsettled drama. Driver, in particular, gives Kylo Ren dimension far beyond that of a spoiled brat villain in over his helmet. As the grandson of Darth Vader but the son of Han Solo and Leia, his allegiance is constantly tested. Yet never forget the sci-fi saga is rooted in fun. There’s delight within the darkness, evidenced by the jokey one-liners and gee-whiz action sequences that fly at a furious pace. Ridley and Hamill use stinging barbs to develop their mentor-mentee relationship. (Snipes Luke, “Everything you just said is wrong!”) Indeed, an emotional moment decades in the making is punctuated with a punchline. I won’t dare reveal it, only to say that I’m willing to bet money that Fisher, a renowned wit, ad-libbed it. Even the Porgs, those big-eyed owl-like creatures, get grown-up laughs. They’re not nearly as distracting as the Ewoks! As a kid, Johnson played with Luke Skywalker, Princess Leia and Han Solo action figures and a toy Millennium Falcon in his backyard in California. He has a special connection to Star Wars, and it’s why The Last Jedi at its heart is a love letter to a childhood. From Luke’s sly wink to an old friend to General Leia’s respected, thoughtful leadership, the familiar heroes dominate the screen, earn the biggest applause and serve as a compass to the next generation. That crew will shine on its own soon enough. We hope. Star Wars Episode VIII: The Last Jedi, opens in theaters everywhere Friday, December 15.